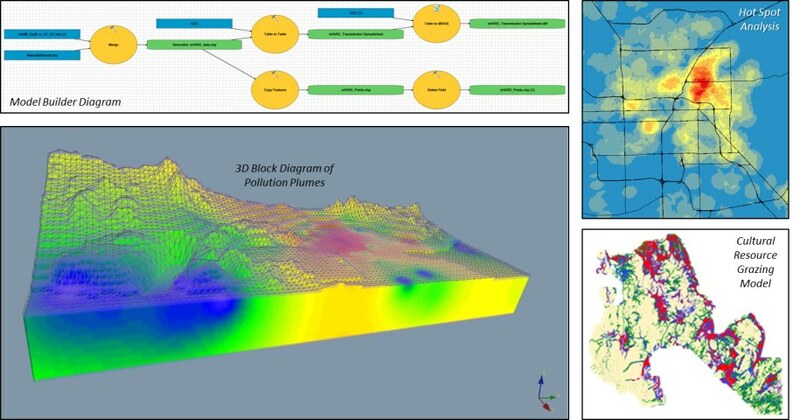 GIS Services | Gnomon Inc.
System Design - The most important step of a GIS project is developing a plan of implementation by which to gauge the status and success of the project. We develop database structures, data collection methodology, and system maintenance procedures for GIS longevity. Cultural Resources - Gnomon has much experience developing cultural resource predictive models based on environmental variables and cultural resource data. These models have been created for various government agencies and other interested parties as tools for land managment and needs assessment. Gnomon also excels in the design and creation of geodatabases for cultural resource records management. Data Collection - Gnomon assists clients in field mapping applications, using both GPS and total stations, followed by post-processing of field data and GIS integration. We have a large format digitizer and scanners for the conversion of existing oversize hardcopy data. Internet Services - In addition to maintaining a full-time web site for itself, Gnomon also provides remote administration of client web sites and internet database servers. We use the web as a means to efficiently distribute information both inside and outside an organization. Custom Applications and Cartography - Gnomon develops custom database and GIS applications for clients to effectively leverage the power of their GIS. Our knowledge of programming languages includes Avenue, AML, Visual Basic, and C. In some instances clients require only a hardcopy map as a finished product. We provide high quality cartographic products.